There are lots of natural alternatives to coffee, but this one (the best one, IMO) is a delicious coffee substitute made from healthy and energizing root plants- you won’t miss the lack of coffee-ness! Root coffee is a natural coffee substitute that you can use to help get your sleep, energy, and even digestion back on track. It’s a delicious drink that you can make hot or iced as a replacement for your daily latte. That alone can save you a ton of money! Read on for tips on how to save money on each ingredient too. You’ll also find variations for a mocha and pumpkin spice latte version below! This gluten-free coffee substitute (that tastes like coffee!) is made with chicory root, dandelion root, and Maca. These are amazing plants that have tons of health benefits! You gotta admit, there’s pretty much no reason not to try this utterly delicious drink. What is the closest drink that tastes like coffee? This one. If you had asked me before I tried this drink whether there was any good substitute for coffee, I would have said no way! Coffee has a delicious (addictive?) flavor that nothing can compete with. Right? I seriously haven’t tasted any coffee substitute I’ve liked more! And I’ve tried a bunch of them. Because of my blah experiences, I had my doubts when trying these ingredients, but the result blew me away! 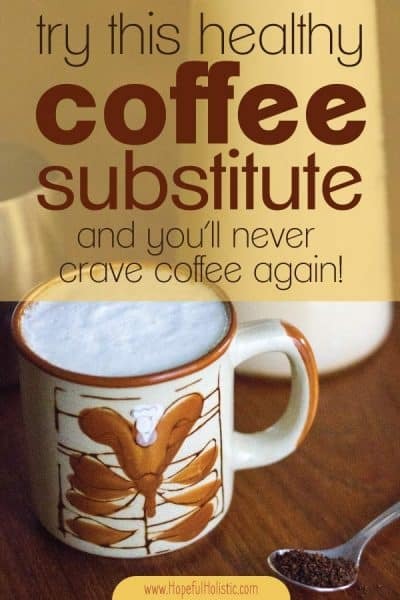 It tastes so good, and it helped me go from a cup of coffee every single day to about once a week! If you’re like me and you’ve tried removing coffee from your morning routine, replacing it with tea or something else, with no success, then this drink is for you! It’s also great for anyone just looking for a yummy coffee-like drink that’s both delicious and healthy. Have I convinced you yet that this drink is for you? If not, here are some of the top reasons you should try making this coffee substitute ASAP. Coffee isn’t unhealthy for everyone, but it also isn’t good for everyone. The reason you find so many conflicting studies on the health benefits of coffee is because we’re all different. If you drink coffee and either don’t feel anything or feel jittery, then your body might not be one that responds well to coffee. For me, I didn’t feel much at all after drinking caffeinated coffee. I just liked the taste- and I thought I’d never find anything that tasted as good as a freshly brewed cuppa! This recipe proved me wrong. I would crash almost every afternoon, so I knew it’d be good to try to cut back on coffee. It’d be worth it for anyone to try going without coffee for a while and see if you feel better! And if you’re too addicted to go without, that’s a sign you should cut back also. This root coffee drink is good for phasing out coffee- it’ll help you not to miss the taste. It definitely helped me! If you want some other ways to increase your energy without relying on caffeine, check out my post on how to get more energy all-naturally. And if you’re just looking for a simple pre-made mix that you can just stir up and go in the morning, you should try Maca coffee- the Morning Motivator! It’s just as good as the recipe below! Even if you have zero side effects from drinking coffee, coffee isn’t good for anyone to drink after 2 pm. Even if you don’t feel a burst of energy, the long half-life of caffeine means that it still sticks around in your body and can decrease your sleep quality. But this root coffee actually helps support restfulness! It can help you wake up in the morning without crashing later in the day, and it includes an all-natural source of energy for your mornings. 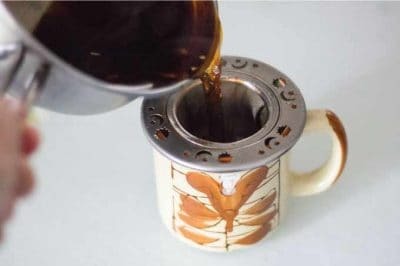 If you really can’t do without caffeine and you’re looking for caffeine alternatives to coffee, I’d recommend tossing in some black tea while it’s brewing. This is one way you can make a coffee substitute with caffeine included. There’s less caffeine in black tea than in coffee, but it will still give you a boost in the morning. Overall, this coffee substitute is a fantastic alternative to coffee for energy. Drink this instead of coffee to wake up and feel energized throughout the day. Say goodbye to caffeine headaches and coffee cravings! This drink is fantastic for anyone with gluten sensitivities– some of the top store-bought coffee substitutes, like Pero and Cafix, contain barley or malted barley, which has gluten. This ain’t no roasted grain beverage. This one is a paleo, gluten-free coffee substitute with a vegan and dairy-free option, so anyone can enjoy it! Those other store-bought coffee substitutes also mean that you’re buying a plastic case– but this natural coffee sub is completely sustainable and zero waste (depending on where you get ingredients- try shopping at your local co-op or bulk store). So feel free to drink it guilt-free! And guess what- you can also compost the grounds! Did I say this already? I’ll say it again. This coffee substitute is soooo gooood. I didn’t think anything could replace coffee in my life, but now I drink this regularly, and I enjoy every single sip. It’s warm and creamy, and the flavor is chocolate-y, and coffee-like, and wonderful. I love it alongside the fluffy gluten-free biscuits (with honey!) that hubs makes on weekends sometimes, or as an afternoon pick-me-up. I love two-for-one deals. And this coffee substitute is one of them! Not only is it delicious, but it’s also really good for you! Bonus! Unlike coffee, which has debated health benefits that probably don’t apply to everyone, these ingredients -chicory root, dandelion root, and Maca- are beneficial for everyone. Chicory root is amazing. It’s a woody plant from Europe and the Americas, and it’s been used for hundreds of years in natural remedies. Chicory helps with numerous gut issues including indigestion, acid reflux, constipation, and heartburn. Chicory contains inulin, which is a potent prebiotic, meaning it feeds the good bacteria in your gut. This can help with immunity, leaky gut, and a host of other problems! If you’re looking for more prebiotic foods to help support a healthy gut, you can check out my homemade, no-sugar applesauce recipe! Chicory is also good for boosting your immunity, supporting your kidneys, reducing your risk of cancer, aiding heart health, and reducing pain from arthritis. Not to mention it can reduce anxiety and stress. Stress is a huge factor in many diseases and can decrease your immunity. Drinking something to soothe your anxiety, instead of making you jittery like coffee, is a huge help to your health! This is an amazing plant to bring into your diet! I love getting roasted chicory root from Starwest Botanicals– I know they’ll always send me a high-quality product. And (at least at the moment I’m writing this) it’s cheaper to order from them than directly from Amazon! I buy the organic roasted granules and use them straight from the bag. It saves time and actually costs less than buying the raw root, which you’d then have to grind and roast yourself. Equally amazing is the delightful dandelion (Taraxacum officinale) – yes, the one that grows in your backyard! This little plant is easy to find and harvest (fall is the best time to harvest roots- learn more about that here) and has even more health benefits for ya! It’s fantastic for liver health and balancing blood sugar. It’s also a slight diuretic, meaning it helps to increase the production of urine. This can help to fight bladder infections and UTIs! Just like chicory, dandelion root also has inulin, a prebiotic fiber that feeds a healthy gut and helps support digestion while reducing constipation. Some studies suggest dandelion root can even reduce fatigue and lower cholesterol! Dandelion root supports the liver and helps the body get rid of waste and toxins. Doing your own dandelion root tea detox is easy! To make dandelion root tea, just take a teaspoon of roasted dandelion root and steep it just like regular tea for 5-10 minutes. Drinking dandelion tea before bed can also aid in detoxification and help you sleep. Drink a cup one or two hours before you go to bed for the best results! One of the side effects of dandelion root is a slight diuretic effect– or an increase in urine. This is great for cleansing the body, but it might not be the best idea to drink dandelion tea immediately before bed! The good news is that you can get exactly the same ingredients to make dandelion tea and root coffee! I buy my organic dandelion root at the same place I get chicory root- Starwest Botanicals! It’s also cheaper than buying it straight from Amazon. Surprise! Dandelion root is also easy to roast if you want to save some money by buying it raw. Just spread it out in a cast iron pan and stick it in the oven on broil until it turns golden brown. Roasting it smells amazing too! Starwest Botanicals also has dandelion tea blends. One is a Joint Support tea (with other herbs including burdock root, licorice, turmeric, and cinnamon!) and one is called Regularitea for… erm… regularity. It’s got a fantastic blend of herbs including buckthorn bark, marshmallow root, and ginger. Maca is another beneficial root vegetable. This one grows in the Andes mountains, and it has a sweet, earthy flavor. Studies are still being done on the benefits of Maca root, but studies have shown some great facts so far! Maca is nutritious and a great source of vitamin C, copper, iron, and fiber. The flavonoids in Maca root can help reduce anxiety and depression. Maca root also improves learning, memory, energy, and endurance. It’s also great for aiding fertility (for men and women), improving libido, and decreasing erectile dysfunction. You can read more about Maca powder at my post on the benefits, side effects, and how to use Maca root. And personally, I just really enjoy the taste. 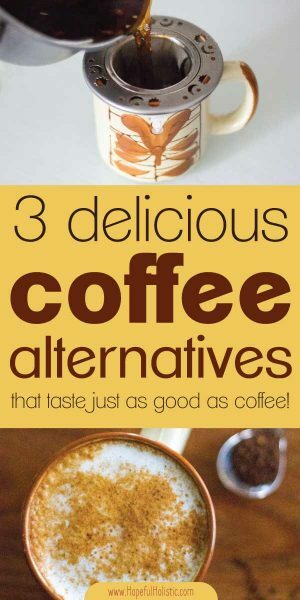 It adds a wonderful flavor to this coffee alternative! This recipe is definitely my favorite way to use Maca root powder. But beyond this drink recipe, there are a ton of other yummy ways to use Maca powder too- you should check out these awesome Maca recipes! I looove Maca by The Maca Team. 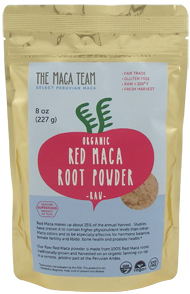 I buy the raw organic red Maca root powder, which has the highest nutrients of all Maca! Their Maca is also fair trade, non-GMO, and certified organic. You can find which Maca is the best for you using their Maca Finder. You can also find Maca on Amazon, but I prefer ordering straight from The Maca Team because 1. it supports small business, 2. it’s usually cheaper than Amazon prices, and 3. The Maca Team makes sure your raw, organic Maca won’t be radiated during shipping! I love the sweet flavor and all the bonus health benefits of Maca powder! Probs the best part of this whole recipe. Now that you know all of the ridiculously amazing benefits of root coffee, on to the recipe! Making your coffee alternative is just as easy as making coffee. First, bring a cup of filtered water to a boil on the stove, then turn off the heat and add a teaspoon each of roasted chicory root and roasted dandelion root. Stir it up and enjoy the smell! That’ll steep for 5ish minutes. If you don’t have a milk steamer, add half a cup of milk to the pot so that it can heat up along with the water. 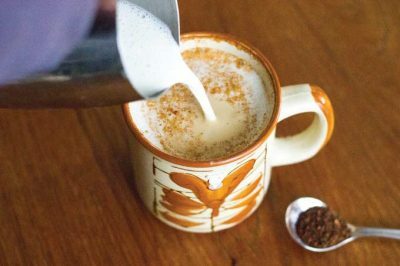 I enjoy using a milk steamer with my homemade almond milk because it makes the drink frothy and even more like a latte! 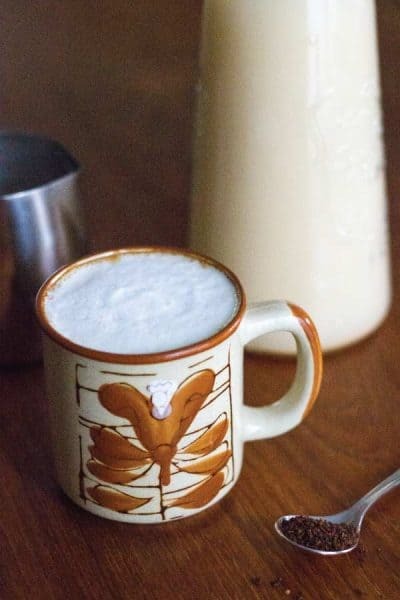 If you have a milk steamer, froth up a half cup of almond milk (or regular milk) while your root coffee is steeping. When the five minutes are up, strain the root coffee into your mug. I enjoy using this little tea strainer– it’s served me well for years! Mix in the Maca powder, sweetener, and collagen (if you want an extra boost- it’s great for your skin and digestion! ), and top it off with steamed milk. 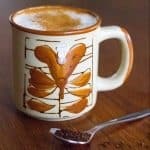 A delicious, healthy, caffeine-free root coffee - this is the best alternative to coffee you'll find! Bring one cup of water to a boil, then turn off heat and add chicory and dandelion root. Steep for 5 minutes. While the root coffee is steeping, steam milk. Strain root coffee into a mug, stir in Maca, collagen, and sweetener to taste. Top off with steamed milk and enjoy! If you don't have a steamer, just add your milk to the water and heat it on the stove, or use more water and add a splash of milk to your cup. Try it iced, or as a mocha or pumpkin spice latte! Now that you know how to make a delicious coffee alternative, why not try some of these (even more delicious) variations? Or try making up your own! This one is my hubs favorite- he asks me to make it all the time! Making a mocha coffee alternative is super easy too! Make it just like above, but add a teaspoon of cacao nibs to the pot along with the chicory root and dandelion root, and mix a teaspoon or two of cocoa into your mug along with the Maca powder. Easy peasy! I love it with either English toffee stevia or maple syrup. Who doesn’t love a good PSL? This is a fantastic coffee-free alternative to the beloved pumpkin spice latte. And it’s just as good! Another bonus: this recipe is even easier than the mocha! But if you want, you could try jazzing it up by adding a teaspoon or two of real pumpkin! Just stir it well or blend it in for an even more pumpkin-y drink! Prepare your PSL coffee alternative just like above- except that you mix in a teaspoon of pumpkin spice along with the Maca powder. If you don’t have pumpkin spice, you can get it here. Or just add a dash of cinnamon, ground cloves, nutmeg, ginger, and allspice. 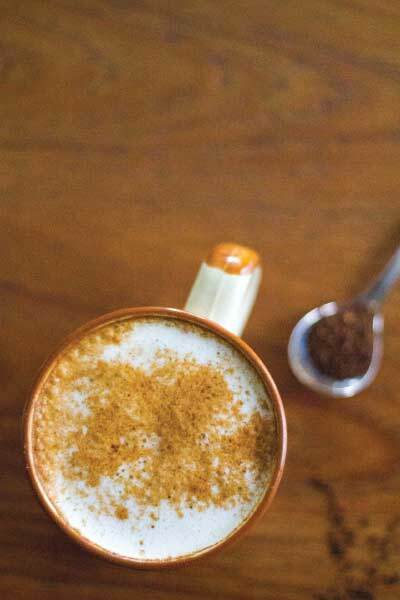 Top with steamed milk and a dash of pumpkin spice, and enjoy! Let me know what you think of this coffee alternative in the comments below!